I love the picture I have seen of people standing on the edge of a thin rock that looked like it will break at any moment. 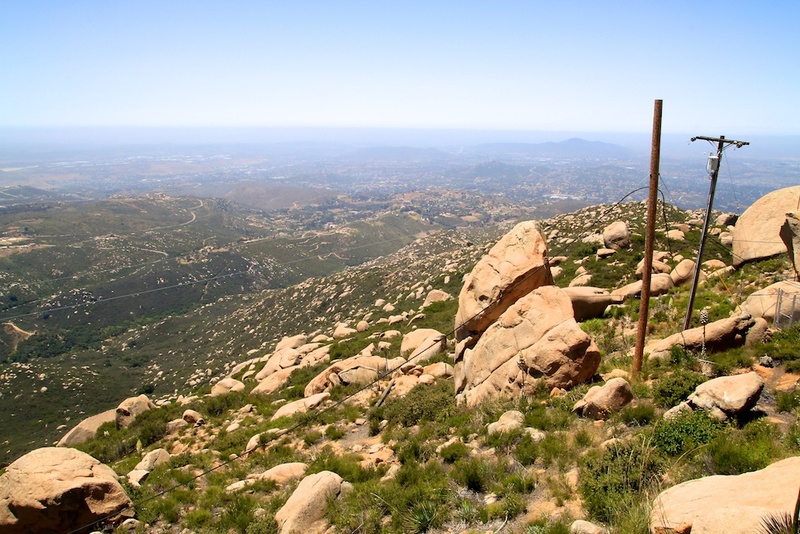 Upon additional research, I found out that the rock as mentioned above is outside of San Diego on top of the Mt Woodson summit. 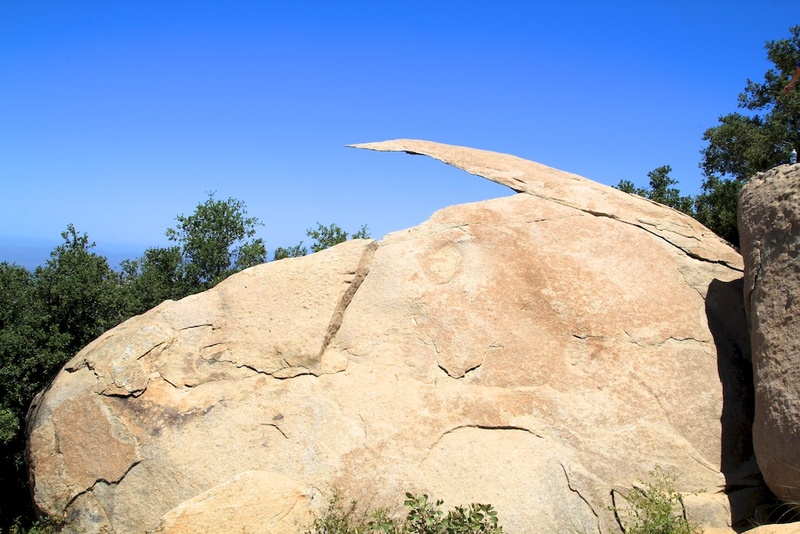 I figured I had to check it out, so a little while ago I made the 4 miles trek each way to what is affectionately known as Potato Chip Rock. 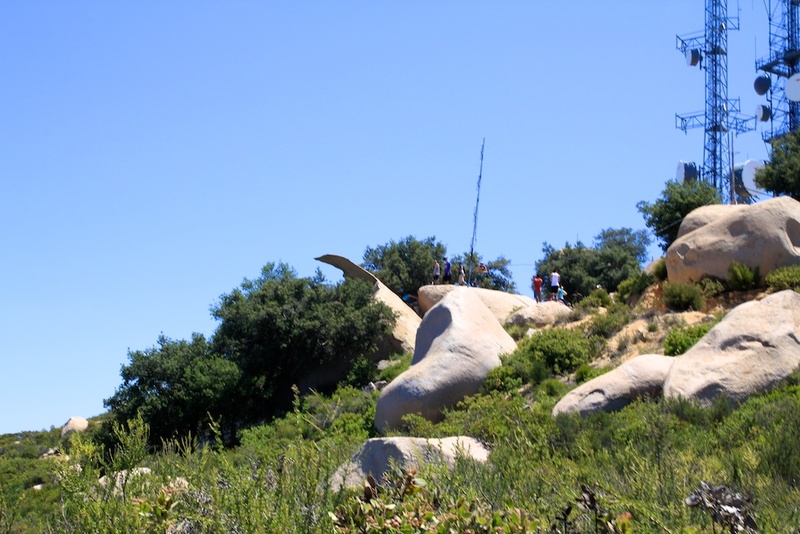 The hike to Potato Chip Rock is in Poway near Poway Lake. It is 5 to 10 minutes off the freeway, and it costs $8 to park if you do not live in the city of Poway itself. 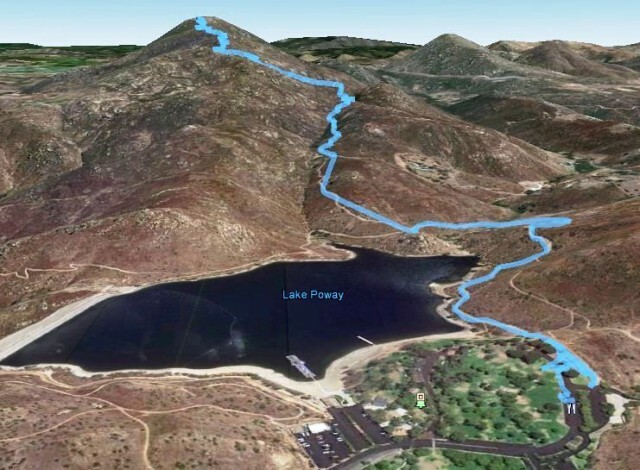 Once you park in the top parking lot, the trailhead starts near the bathroom and wraps around the lake. 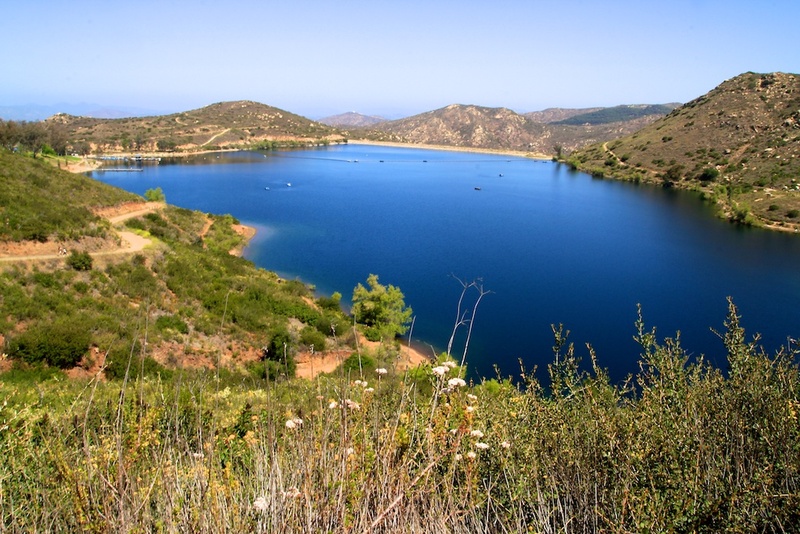 The trail winds around the lake for about a mile before you reach the actual trailhead. From there it is about 3 miles to the summit. Be prepared though because there is significant elevation gain to the summit, and it is basically straight up the whole way. Here is the Google Earth View of my GPS recording to give you a feel. 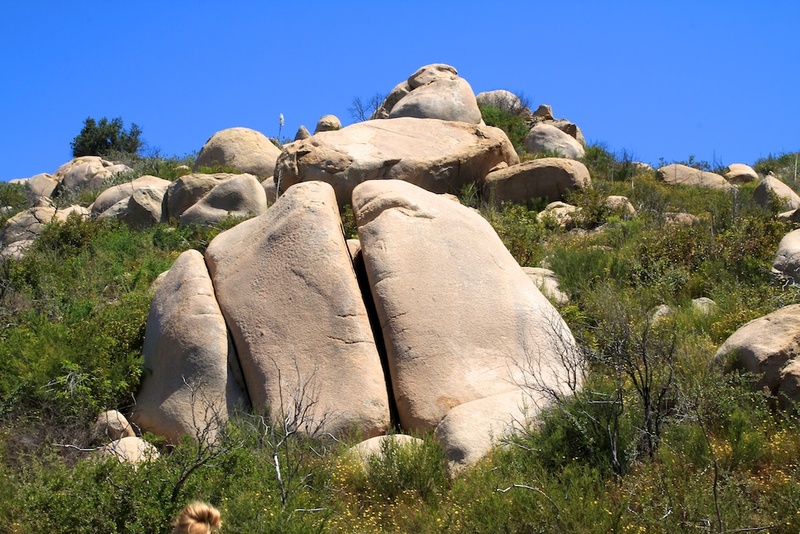 There are a lot of unique rock formations along the trail and mountain that will make your walk up interesting. 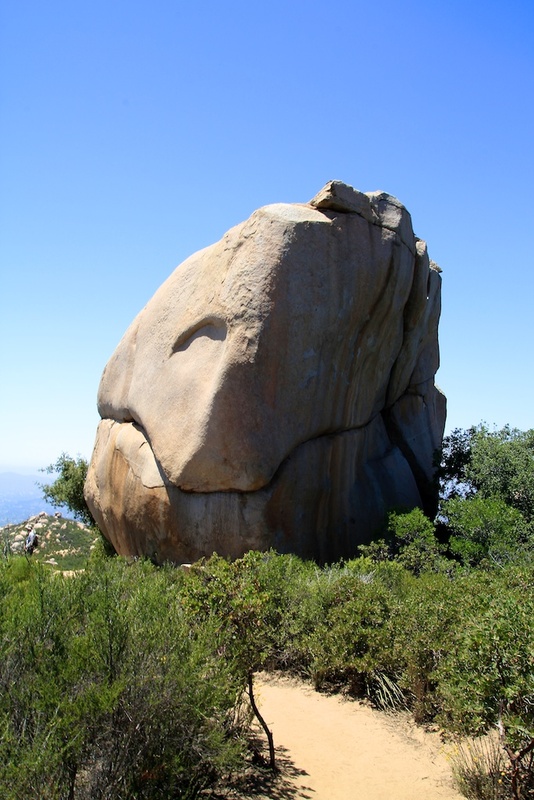 Think of it as whetting your appetite for what is to come: the crazy Potato Chip Rock. Also of note: there is only one place that has any real shade on the trail from here. It is a little tree about halfway to the top, and it is a great place to relax if it is a hot day. We went through about three liters of water on the trip and still ran out with about a mile left, so make sure you have a lot of water if you are going in the hot summer months. The trail itself is well maintained and relatively easy to follow all the way to the summit. 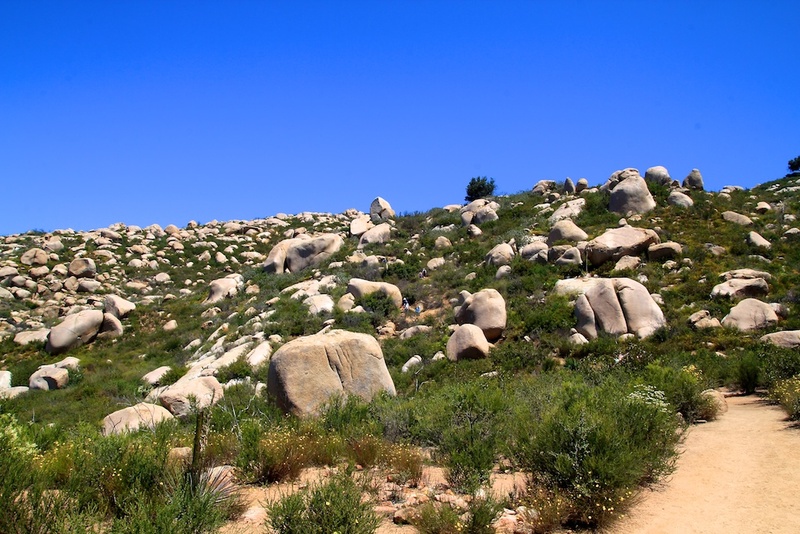 Once you reach the top of the mountain, there is still about a half mile walk to the actual potato chip rock. By this time, you will surely be tired, but keep pushing — you are almost there! There are also a lot of cool rocks up here to boulder on if you like that sort of thing. 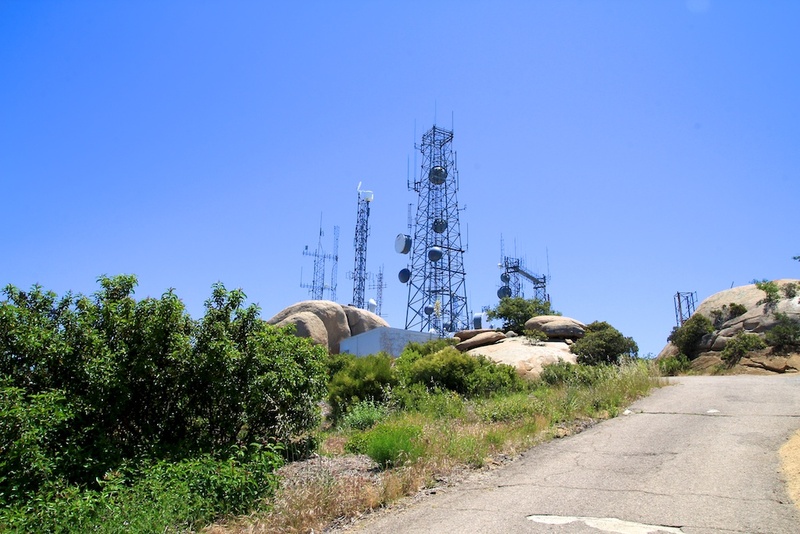 The actual summit itself is overrun with antennas, which subtracts from the view, but on a bright day, you can still see a lot of San Diego from here. Check out the view from the summit. 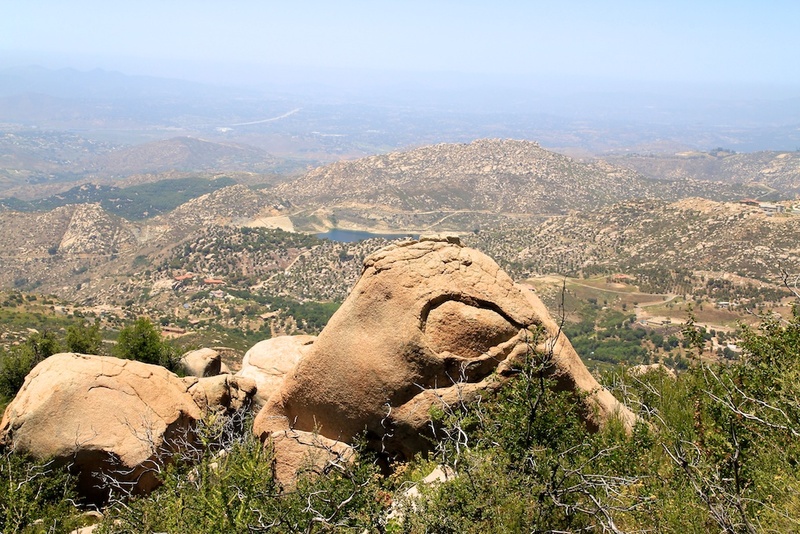 When you are about a quarter-mile away from the summit (the rock is before the summit), you will see Potato Chip Rock in the distance. This is the real highlight of this trek as it is a unique rock. This rock requires some scrambling to get to the top of and while it looks terrifying to stand on it doesn’t feel that way until you actually get up on it. At that point, you can hear the echo of your footsteps, and that is a little weird. Of course, it should go without saying, this rock will one day break, so make sure you are careful if you chose to walk out on it. The rock does create a fun photo, but the area can get packed though, so you may have to wait in line. The rock itself is about 100 yards below the summit. Once you are done, you can head back down the way you came. 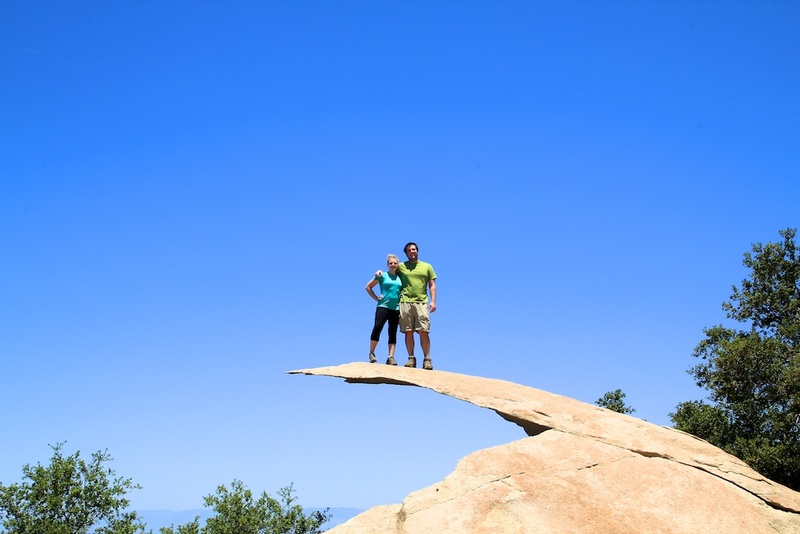 Potato Chip Rock is a great hike to explore the beauty of North San Diego. I like to climb mountains that have something unique at the end, and this one definitely does. Just be sure to take lots of water if you go in the summertime. Check out the rest of the photos, get directions and leave me a comment below.